I'VE BEGUN TO SELL BEAUTICONTROL ITEMS HERE ON eCRATER. ALL OF MY BEAUTICONTROL ITEMS ARE LISTED 20% BELOW RETAIL (UNLESS OTHERWISE NOTED). 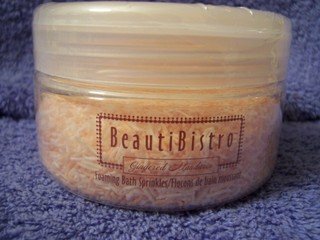 THIS LISTING IS FOR THE "BEAUTIBISTRO" GINGERED MANDARIN FOAMING BATH SPRINKLES FULL SIZE CONTAINER (3.5 OZ). THESE BATH SPRINKLES ARE BRAND NEW, NEVER OPENED AND STILL SEALED. BE SURE TO CHECK OUT ALL OF THE GREAT DEALS I HAVE AT TOPNOTCH4LESS! YOU'LL BE SURE TO FIND SOMETHING YOU LOVE!! Domestic shipping charges are listed below. In most cases, if payment is made Monday through Friday in the morning, packages will be mailed that same day. If payments are made in the late afternoon or evening or on the weekends, packages will be mailed the next business day. This, of course, excludes holidays. I ship via U.S. Postal Service, unless otherwise noted. I will contact you after shipment is made, conveying the delivery confirmation number, along with the estimated in-transit time. ATTENTION INTERNATIONAL CUSTOMERS: Please contact me before the auction ends for a shipping quote. I GLADLY ship internationally. I cannot, however, assume responsibility for any delay in your country's customs. Additionally, you will be responsible for any of your country's customs charges. I TRY TO COMBINE SHIPPING WHENEVER POSSIBLE. IF THE WEIGHT OF THE PACKAGE DOESN'T INCREASE THE POSTAGE, I USUALLY DO NOT CHARGE FOR ADDITIONAL ITEMS. PLEASE CONTACT AHEAD OF TIME IF YOU ARE LOOKING TO PURCHASE MORE THAN ONE ITEM. MEN'S ASHWORTH GOLF SHIRT, SIZE XL, RET. $58+, GUARANTEED AUTHENTIC!